After I finished this weekend’s cooking marathon, I flopped into my favorite chair, iPad in hand, for a little internet browsing. As I filled my mind with inane fodder from all corners of the World Wide Web, I happened on the discovery of the century: Mason Jar Salads. I love salad of all kinds, but this once a week cooking business has all but eliminated salad from our menu, after all, who wants to eat a limp, soggy, week old salad? I never would have dreamt that I could make salad on the weekend that would taste fresh days later. I was so excited. Probably more excited than I should have been. I woke up early Sunday morning, searching feverishly for the perfect salad recipe. Not only did it need to sound tasty, but it needed to use up the veggies that were left over after making Pad Thai the day before and as many ingredients that I already had on hand as possible. By the time the sun came up, I realized that the perfect recipe didn’t exist, but, I hope, I had figured out how to properly layer an Asian themed salad which could use leftover romaine, mushrooms, and carrots, from the Pad Thai and edamame from the freezer. 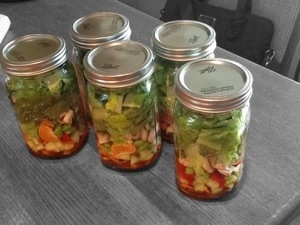 After a trip to get more mason jars, I was excited to get started building my salads in a jar. Carefully layering the ingredients in the jars was kind of fun, in large part because they looked so pretty when they were finished. On day two, I can confirm that my first salad tasted freshly made. I will try to remember to update on Friday to report back on how the salads hold up through the week. From what I’ve read, they will hold up just fine for up to five days. The key is that the wet ingredients are separated from the more delicate ones by the height of the container. In theory, this means that the lettuce does not turn into a pile of slime after a few days. I look forward to a success story later in the week, as it will certainly be quicker and easier to only cut and wash salad veggies once per week! Layer ingredients in five mason jars in the order listed above. Do not shake or turn upside down until you are ready to enjoy! I have been doing a pretty poor job of both working out and cooking lately. The Spring seems to be doing me in. We have a great outdoor living space and lately I have been taking advantage of it more than I should. After work it seems much more appealing to lounge on our outdoor sofa reading a book than it does to make dinner or, gasp, go to the gym. Eventually that may catch up with me, but for now I’m just rolling with it. Yesterday morning I went to my first PT appointment to get fitted for orthotics, learn a set of exercises to improve the stability of my left foot, and get my back to running program. Now that working out involves running, I have a feeling that I will be more driven to get my tail out the door. That whole cooking dinner on a regular basis thing may still be out the window though. Chris has been on a pizza-making kick and I’m quite comfortable with eating as much pizza as he is willing to make. So how about this Curried Pineapple Qunioa? After serving some pretty disappointing and bland quinoa on Saturday night, I decided that the leftovers needed to become something spectacular for Sunday’s dinner. Ok, spectacular is a strong word to use to describe any grain based dish, but this hit the spot. 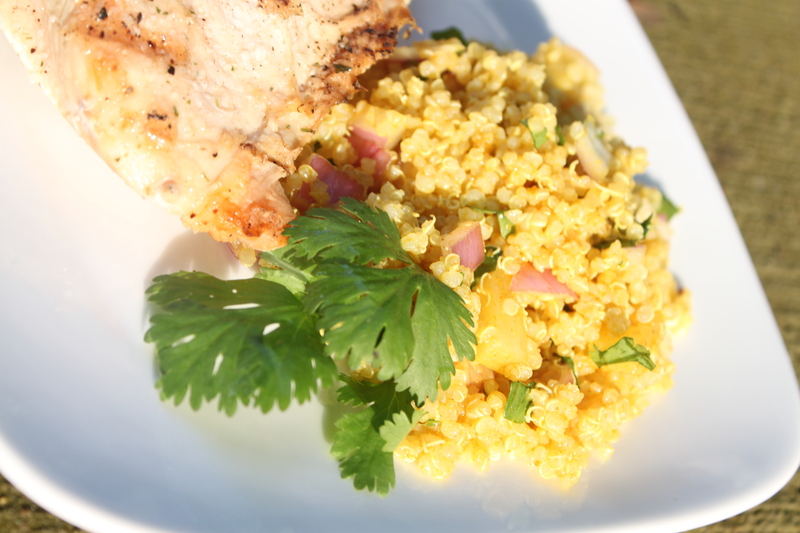 The cold sweet pineapple made this dish light enough to serve outside on a hot, not quite summer day while the curry, red onion, and cilnatro packed a flavorful punch! Adapted from Poor Girl Eats Well. Combine the dressing ingredients in a small bowl and whisk together to combine. Set aside. In a large bowl, combine the salad ingredients and toss together. 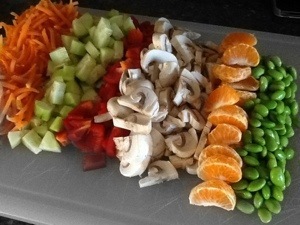 Fold in the dressing until well mixed. In lieu of a Mother’s Day celebration on Sunday, Chris and I decided to grill. It isn’t that we didn’t want to celebrate Mother’s Day, it is just that our mothers live way too far away for a proper celebration. 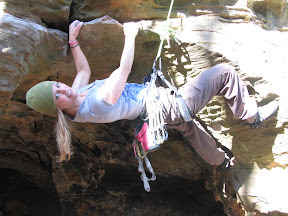 The weather in Indiana was beautiful this weekend except for a few short rain showers on Saturday and we got so much accomplished. We were able to get all most of our grass mowed, our flower beds weeded, changed the oil in our cars and the tractor, went grocery shopping, went out for sushi, took the dogs out for a walk, went to the gym, and spent a decent amount of time preparing for a big change, still under wraps for a little while, at Duke’s House. Finally, we had some down time on Sunday night and got to grill and hang out on our back porch. Too bad everyone else we knew was busy with Mother’s Day because the kale was good enough to serve to company. 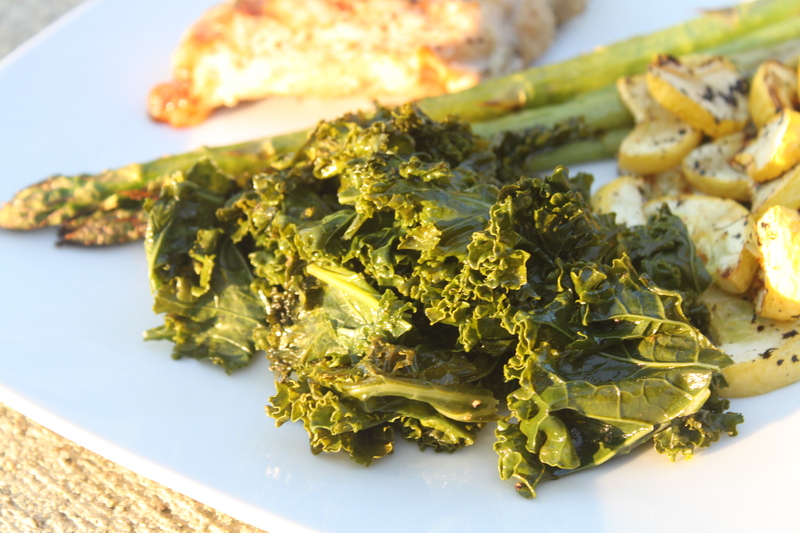 This was both of our first times grilling kale and it was a big time win! I almost always like to have some type of salad-y element to my dinner, but I do not always feel like dealing with making a salad. Grilled kale was a much easier alternative. From Daily Unadventures in Cooking. Place two sheets of aluminum foil, about 18″ each, perpendicular to each other on your work surface to form a cross. Chop kale into bite size pieces, removing stems, and place the kale in the center of the foil. Sprinkle with salt, pepper and olive oil and lightly toss. Roll the top sheet of foil tightly around the kale. Fold the bottom sheet around the top roll, burrito style to form an airtight pouch. Heat a grill to a medium heat, then place the pouch on the grill for about 12 minutes with the lid closed. Remove from grill, carefully unwrap package and drizzle with lemon juice. Can you guess what my CSA gave me today? 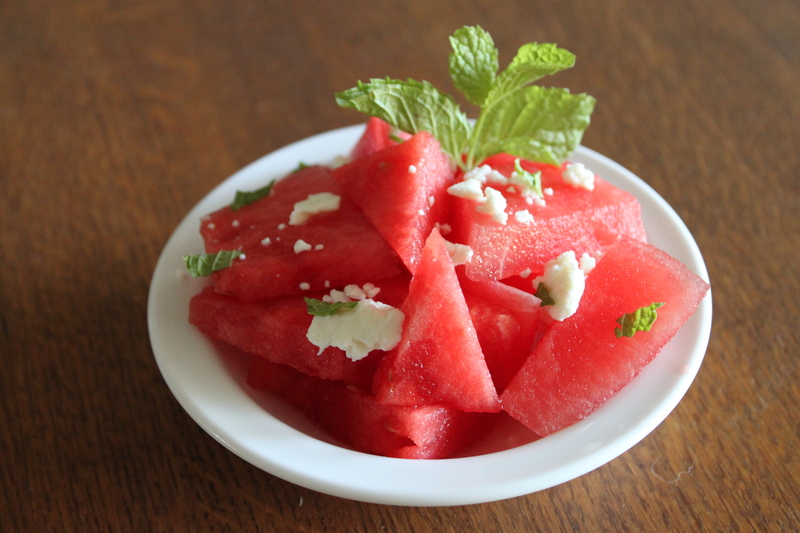 Anyway, watermelon salad is great on a hot summer evening (it sounds weird to say that in September). My watermelon salad was cool and refreshing enough to eat outside in spite of the 90 degree temperatures. Can you see a theme here? I have been feeling pressure to use our back porch now that I know that summer is ending. It is funny how easy it is to say ‘Nah, it’s too hot tonight.’ when you have two months of summer left, but suddenly when you only have a few precious weeks of nice weather left there is no ‘too hot’. I hope you’re making the most of yours also! Adapted from: Good Life Eats and Bon Appetit. This simple dish hit the spot on one of our last 90 degree August evenings. I liked that there was no actual cooking required and that since it is served cold I could actually stand to eat it outside. In the last few weeks of summer, I have been trying to make a conscious effort to use our back porch more. We seem to gravitate indoors during June and July when the heat combined with the humidity can make it absolutely stifling to hang out outside. August has still been warm, but not especially humid. The fresh flavor of this dish would work great with grilled chicken or grilled fish. 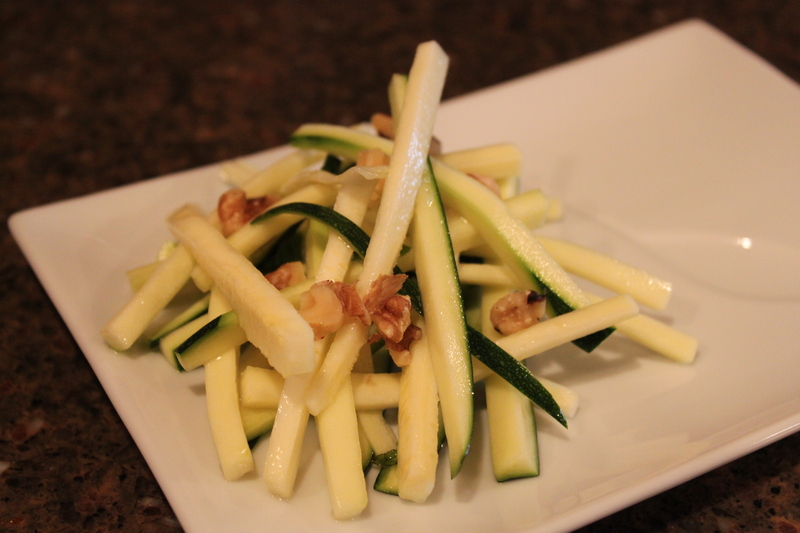 Toss the zucchini with salt and let stand 5 minutes. Drain off any liquid that accumulates in the bowl. Add the lemon juice and mint, and let stand for about 20 minutes. Taste and adjust lemon, mint, and salt, then top with walnuts to serve. I did the unthinkable this morning. I decided what I wanted for dinner ahead of time. Unfortunately, it was not early enough for me to take the tempeh that I wanted for dinner out of the freezer before I went to work. That’s ok though, I thought, I’ll take it out when I go home for lunch. Yeah, not so much. You see I locked my keys in the car during lunch today. Brilliant, huh? Needless to say, I didn’t make it home for lunch today. So my dinner plans were foiled. Just from reading this recipe, I could tell that it would be great! I ate my eggplant with some quinoa cooked with garlic in chicken broth on the side. Mmmm! In case you are wondering, there was more okra in my CSA box! More okra recipes coming soon! Peel eggplant and slice into ½ inch thick rings. Place eggplant slices on a sheet of paper towels and sprinkle it with salt on both sides. This will cause the eggplant to release a lot of liquid which will make it less watery when it is cooked. Let the eggplant sit for 15 minutes, then dry both sides well with paper towels. In a large bowl, mix the honey, garlic, paprika, balsamic vinegar, salt, and pepper. 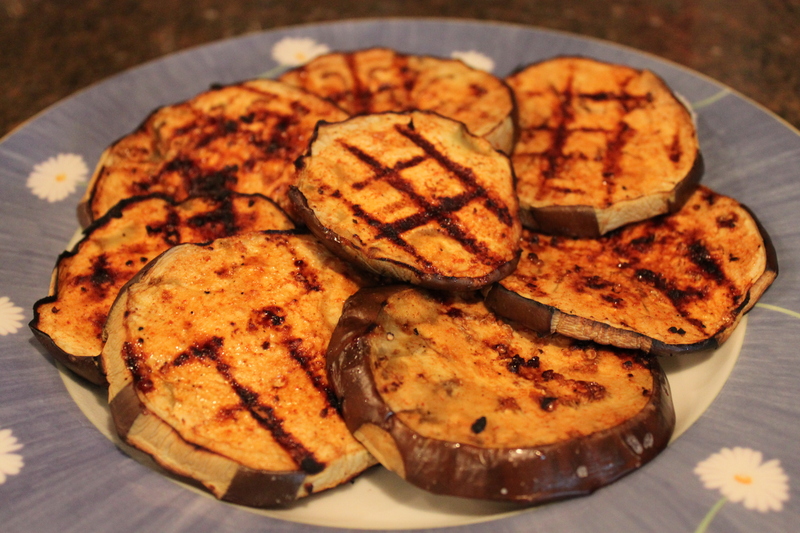 Dunk both sides of each eggplant slice into the marinade, then place the slices on a dish to take them to your grill. Using a grill brush, lightly oil the grill grate with olive oil. Place the eggplant slices on the grill, close the lid, and turn down the heat to medium. Grill for about 3 minutes until the eggplant has grill marks. Turn the slices 90 degrees to make cross-hatch grill marks, then grill until marked, about 3 more minutes. Brush the slices with remaining marinade, flip them, then repeat the grilling process on the other side. Be sure to regulate the heat so that the eggplant is browning, but not burning. When the cross-hatch marks are complete, remove from grill and serve warm. As usual, we have more corn than we know what to do with. Surprised? No, I’m not either. We did join a CSA in Indiana after all. Fun Indiana fact: Indiana is the 4th highest corn producing state. In a typical year, Indiana farmers plant about 6.5 million acres of corn. Considering that the state has only 6.4 million people, that is pretty crazy to think about! I think most of it is feeder corn, but I’m convinced that my CSA is giving out one acre of corn per customer this summer! When I saw this recipe on Sing for Your Supper, it sounded perfect to me! I really enjoy the combined flavors of honey, lime, and cilantro and this recipe uses them well. This fresh tasting, sweet, but tangy side dish can hold its own at any barbeque! I have grilled the corn in this recipe, although you could just as easily use frozen or canned corn. I hate washing pots and pans and our corn was on the cob, so grilled corn seemed to be a perfect alternative for a lazy time restricted chef like me! Adapted from Sing For Your Supper and For the Love of Cooking. Combine honey, lime juice, cumin, and coriander in a small bowl. 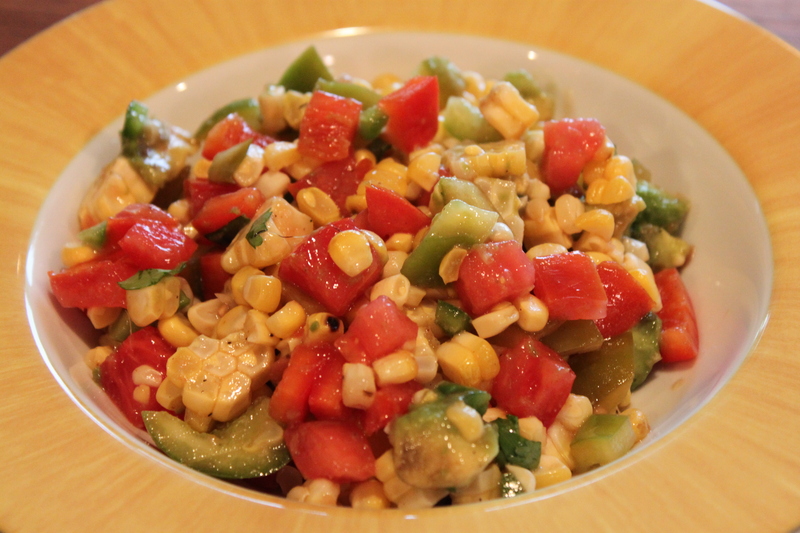 Cut the corn off of the cobs and place in a large bowl with tomatoes, bell peppers, jalapeño, avocado and cilantro.